Home is where the heart is and at Jackson Lile & Close estate agents in Wolverhampton, our heart is in selling your property! We all know moving can be a stressful time and that’s where we step in to make your life simpler. We provide a first class service to both buyers and sellers, with a personal, friendly approach. Through this web site you will be able to search for a wide variety of properties for sale both in Wolverhampton and its surrounding areas. 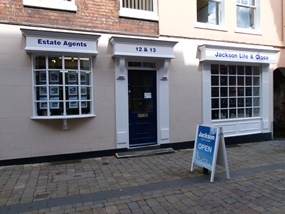 Established in 1954, Jackson Lile & Close is an independent firm of Estate Agents and also one of the founders of Midland Team (a consortium of around 130 other independent Estate Agents Nationwide). Holding a prominent position in King Street, Wolverhampton Jackson Lile & Close is situated right in the heart of the City Centre and specialises in the sale of residential properties within Wolverhampton and its surrounding areas. The Principal of the Company and presently the chairman of Midland Team, Mr. Terence Gibbons Close MRICS IRRV has over 40 years experience in Estate Agency. A Member of the Royal Institution of Chartered Surveyors and also a Member of the Institute of Revenues, Rating and Valuation, Mr. Close has had special responsibility for residential sales, valuations and surveys for Private Clients, Banks, Building Societies and other Lending Institutions. The staff employed are very capable and experienced and provide a very effective sales team thus providing a first class service to both vendors and purchasers alike. Jackson Lile & Close has the ability to assist clients in all aspects of property transactions whether selling a property or carrying out surveys on related purchases. For further information, please do not hesitate to contact us on 01902 712812 or alternatively mail us via our contact page and a member of staff will be delighted to help.